COP24, Wishful Thinking, and the U.S. 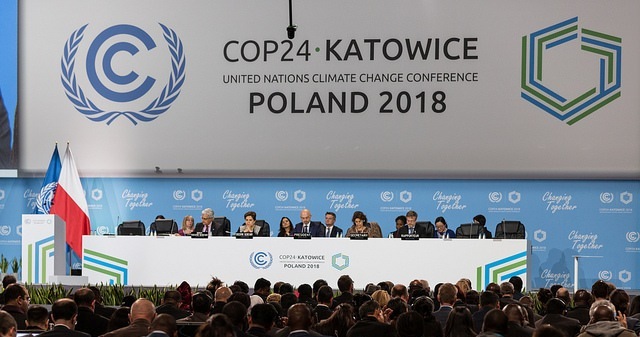 When the UN climate talks at COP24 opened in Katowice, Poland earlier this month, there was good reason to be concerned about the outcome. After much infighting, however, delegates at the last minute settled on most of the rules for putting the 2015 Paris agreement into practice. The new pact outlined how countries will provide information about their climate actions, including mitigation and adaptation measures, as well as steps to provide financial support for climate action in developing countries. “The guidelines will promote trust among nations that all countries are playing their part in addressing the challenge of climate change,” declared the official UN statement issued at the conclusion of the gathering. One could be forgiven, however, for believing this press release reflected wishful thinking more than actual reality. COP 24 opening plenary. Photo by UNclimatechange licensed under CC BY-NC-SA 2.0. The agreement, for example, called on countries to step up their plans to cut emissions ahead of another round of talks in 2020. But the key question of how countries will bolster their targets on cutting emissions was largely overlooked. Current targets, agreed to in the wake of the Paris climate talks in 2015, put the world on course for 3C of warming from pre-industrial levels, which scientists say would be disastrous, resulting in droughts, floods, rising sea levels, and a sharp reduction in agricultural productivity. Perhaps the most disturbing aspect of COP24 was the obstructionist role played by the US. While the country provided important leadership in securing the Paris climate agreement, it proved to be far less constructive in Katowice. Throughout the negotiations the US delegation sought to water down language. Siding with the oil and gas nations of Russia, Saudi Arabia, and Kuwait, it blocked the conference from “welcoming” the IPCC report on the impacts of a temperature rise of 1.5C. Just as infuriating, the US held an event at the conference promoting the continued use of coal, natural gas, and other fossil fuels. In contrast, the European Union and several other developed countries joined with dozens of developing nations in declaring they would focus on preventing a 1.5C rise in their carbon-cutting efforts. At this point in the climate crisis, it should be clear that there are only two ways to move forward. One is to implement clean energy technology on the scale of the Manhattan Project or the Apollo Program and stop the burning of fossil fuels. The other is to accept that billions of people will suffer and die because we refuse to take this course. Cognitive dissonance seems to be running rampant in politics these days, achieving near epidemic levels. Chris Christie accusing Donald Trump of not having the “temperament” to be president of the U.S? Governor Bridgegate? Germany attacking Greece for seeking debt forgiveness — remember World War II, anyone? The Republican party calling for the repeal of the Fourteenth Amendment? Huh? Wasn’t that the heart of the Republican plan for Reconstruction in 1868? The Obama administration topped all of these, however, when it gave final approval to Shell on August 17 to drill for oil in the Arctic Ocean just days after the president announced tough new environmental regulations to cut greenhouse gas emissions from the nation’s power plants. The “Paddle in Seattle” protest against Royal Dutch Shell’s plans to drill for oil in the Arctic Ocean. What to make of this? What happened to the President’s seeming determination to leave the White House with a legacy of climate change progress? The Clean Power Plan, which will limit the amount of carbon dioxide pollution power plants can generate, is expected to reduce greenhouse gas emissions from these facilities 32 percent by 2030. If the plan withstands the expected legal challenges, it will set in motion dramatic policy changes that will close hundreds of coal-fired power plants, halt construction of new coal plants, and generate an unprecedented boom in the production of renewable energy. On the other hand, the approval of Shell’s plan breaths new life into the company’s 25-year bid to open up an area of the Arctic for oil exploration. Shell will be allowed to drill 8,000 feet below the ocean floor, 70 miles off the Alaskan coast. As welcome as Clinton’s opposition to drilling in the Arctic is, it can only leave one wondering about TransCanada’s plan to build a pipeline to transport toxic tar sands through North America’s largest source of underground fresh water, the href=”https://en.wikipedia.org/wiki/Ogallala_Aquifer” target=”_blank” rel=”noopener”>Ogallala Acquifer. Is that worth the risk to this unique treasure? Stay tuned. And don’t forget to take something to ease that pounding in your head. 2015 is shaping up to be the year cognitive dissonance becomes a dominant feature of the modern landscape. Oy vey. Recent events have underscored the slow and uneven pace of progress at the national level regarding clean energy and climate change policies. In this light, it’s also clear that in the immediate future, most real work on these fronts will occur at the local, state, and regional levels. As early as 2002, the Tompkins County Legislature committed to a 20 percent reduction in the county government’s greenhouse gas emissions by 2008 compared to 1998 levels. Mayor Carolyn Peterson was one of the original signatories of the 2005 U.S. Mayors Climate Protection Agreement, and the Ithaca Common Council in 2006 adopted a goal to lower greenhouse gas emissions to 20 percent below 2001 levels by 2016. Cornell University and Ithaca College in 2007 signed the American College and University Presidents Climate Commitment (ACUPCC), whose long-term goal is to achieve climate neutrality. Tompkins Cortland Community College became a signatory the following year, and the three institutions have since invested significant effort towards fulfilling this promise. Cornell’s climate action plan earned it a leadership award last month from Second Nature, which launched the ACUPCC and oversees its operations. The Tompkins County Climate Protection Initiative (TCCPI), beginning in 2008, has built on this impressive foundation to forge a coalition of local community leaders who are committed to reducing greenhouse gas emissions and accelerating the transition to an efficient, clean energy economy. With generous support from the Park Foundation, TCCPI has brought together Cornell, IC, and TC3, Tompkins County Cornell Cooperative Extension, the County Legislature and Planning Department and nonprofits such as the Cayuga Medical Center, Museum of the Earth, Tompkins Community Action, and Ithaca Neighborhood Housing Services. Key business organizations such as the Ithaca Downtown Alliance, Tompkins County Chamber of Commerce, Tompkins County Area Development, and Landlords Association of Tompkins County round out the coalition. The Energy and Greenhouse Gas Emissions (EGGE) element, adopted as part of the 2004 Tompkins County Comprehensive Plan in 2008, provides the guiding framework for TCCPI. The EEGE element calls for an 80 percent reduction of greenhouse gas emissions by 2050, with an annual goal of 2 percent of 2008 level over the next four decades to achieve that reduction. County planners recently secured the support of the County Legislature for an energy action plan that would lead to a 20 percent reduction in the county’s carbon footprint by 2020. Besides facilitating the implementation of a common strategy, target, and timetable for achieving significant reductions in greenhouse gas emissions, TCCPI’s networks are exploring potential financing strategies for purchasing and investing, and new tools that will allow us to monitor our progress through effective data collection and analysis. In the process, by creating a culture of collaboration, we hope to become a model for other communities throughout the nation seeking to adopt efficient, clean energy and effective climate protection. Note: This piece appeared originally in the Ithaca Journal, December 6, 2010.